In October of 2012 my sister Vanessa got one of those recordable books where you can read the book and store the recording for later, safe in the book itself and able to be accessed later at the press of a button. It’s a book to be read to a small child. I had no children at the time, and no real plans for any anytime soon, but we already knew by then that she was going to die and Billy and Jessica helped her get the book to be ready just in case. 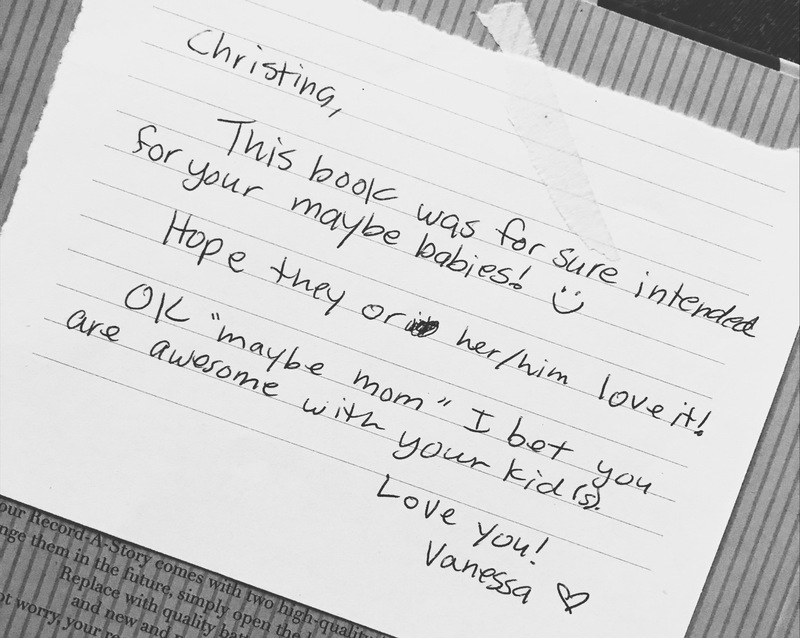 Reading this note gives me so many feels about the slow progression of Vanessa’s cancer. By October 2012, she had already started confusing and simplifying her words. Billy and Jessica had to help her record the book, slowly and carefully, page by page. Because everything changed after that. My marriage fell apart, and then Vanessa died, and then slowly my friends and family helped me find ways to grieve it all and be strong by myself again, and then I fell in love again on accident, and then I moved to Nashville “to see if this relationship can work,” and then it did work, with this wonderful person — a spectacular, kind person whom Vanessa never knew and who never got to know her. And then I got pregnant, and Jimmy and I were sort of terrified, but we took a deep breath and decided to walk together bravely towards the unknowns of our future. Then we got married, in a wonderful ten-minute courthouse-adjacent ceremony where I was scandalously, gigantically pregnant and couldn’t stop giggling the whole time, and where I could have almost burst from the enormity of hope and love present. Then the sister that I still have left threw me a baby shower, and afterwards gave me this book that she had carefully kept wrapped up safe in her basement on the off chance my life would change to welcome a “maybe” (now no longer maybe) baby. And then I went to the hospital to have this baby, and when right at the beginning the IV was botched and my arm blood was all over the bed and it hurt like hell and we hadn’t even got to, you know, childbirth yet, I thought of Vanessa and her years of treatments and surgeries and how she never complained, and how, when she told me on the phone that her cancer had metastasized to be terminal, she tried to comfort me. And so then I had a daughter, an actual living human who I still can’t believe they just sent us home with like we’re grownups and know what we’re doing or something. Then the Winter Olympics opened this month and I was jolted to remember that it was the Winter Olympics, eight years ago, when we first learned that Vanessa was going to die from her stupid, horrible cancer, and how I spent that day in 2010 shell-shocked and frozen and staring at the television to have something else, anything else, to think about. 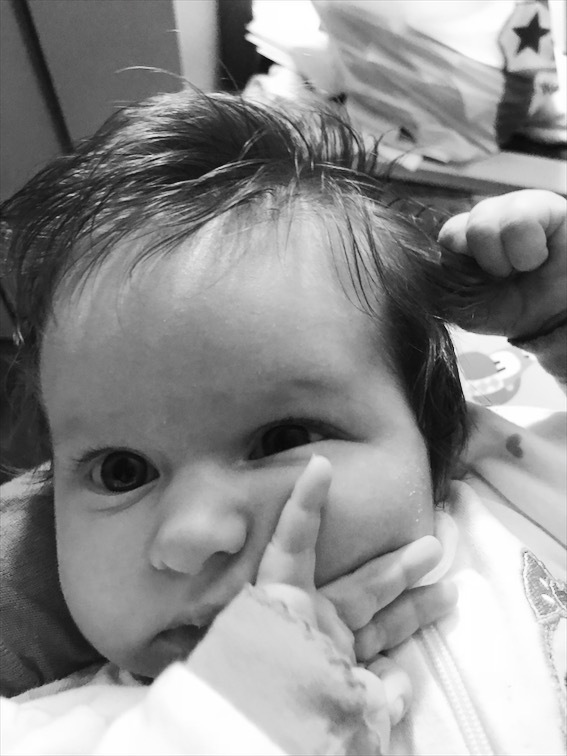 Maybe Dottie will be a hair-twirler, just like her auntie Vanessa. Now my daughter, Dorothy Vanessa, is two months old, so little and so infinite. She is beautiful and good, and she will never know my sister, her aunt, the beautiful and good woman who inspired her middle name. I take cute videos of my Dottie and then I send them to Mom and Jess in the group chat we have, and we all feel but don’t need to say how Vanessa should be in that group chat too because she deserved to be, she deserved to live to see what we are all becoming, and it is so sad and so wrong that she has been gone for four years. This never gets easier. It just changes, from year to year. I am humbled by my sister’s faith in me. I am staggered by and so very grateful for her love, even now. Vanessa was beautiful inside and out!